Sherline milling collets are designed to be used with the Morse #1 internal taper that is standard on both the Sherline lathe and vertical mill. Because of the shallow angle of the Morse #1 taper when the drawbolt is tightened, greater clamping force can be applied when compared to the clamping pressure of WW collets. 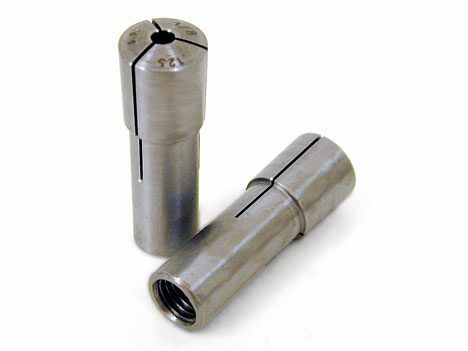 Therefore, we recommend the use of these milling collets for holding miniature size end mills (3/16″ or 1/4″ shank), #1 and smaller center drills or Dremel® bits (1/8″ shank), and assorted other cutters. Cutting tools held by these collets must have a shank size within .001″ of the manufactured size. 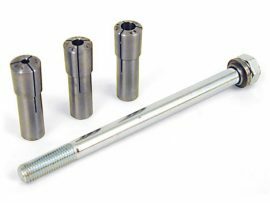 Because of the shallow taper angle, these collets will not loosen from the spindle without backing the drawbolt off a couple of revolutions and tapping the drawbolt to free the collet.